Well it’s hard to believe that 2013 is rapidly coming to a close. With my new position as a State Legislator in Maine, 2013 has been a whirlwind. Sadly with all the time I have been spending in Augusta I haven’t had as much time to cook or to blog. Luckily the holiday season has given me some free time and I’ve decided to catch up on blogging. Below is one of my favorite apple recipes. Every fall I turn into an apple fiend. As soon as the first Cortlands are ripe I dash off to Willow Pond Farm to pick at least one hundred pounds of apples to can, cook, eat, and store. 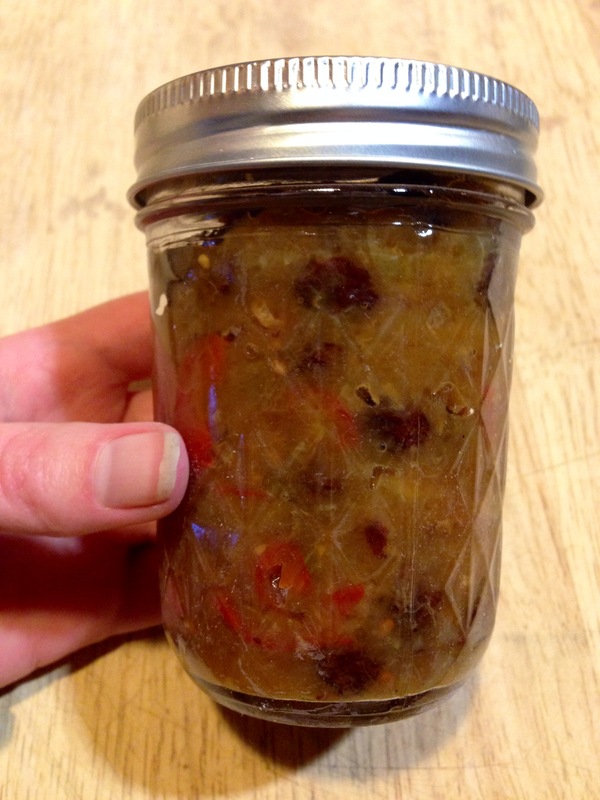 This apple chutney recipe is a great use of several varieties of apples. Also we had a bumper crop of peppers this year from Dad’s garden (we picked our last ones at the end of October) so this recipe was a great combination of all of our fall crops. This chutney is the perfect condiment to have in your fridge for the holiday season. It goes great with roast pork, sharp cheese, and my family even puts it on toast. My favorite way to use it is to have it with a grilled cheese sandwich. This chutney is not too sweet and packs a pleasant punch. Enjoy! Wash and chop all fruit and vegetables. Combine all ingredients in a large heavy-bottomed saucepan. Simmer the chutney, stirring frequently, for two hours or longer. Keep tasting the chutney to determine when the sauce is done. At this point you can store the chutney in your fridge for up to two months. The longer the chutney sits the better the flavor gets. If canning the chutney pack the pint jars while the chutney is piping hot. Leave a 1/2 inch headspace and process for 15 minutes. I hope that all of you had a tasty and relaxing Thanksgiving!